African football shorts for the month. Botswana's Football Association (BFA) want an overseas coach to take charge of the national team coach. The BFA put out an advert on Wednesday as it looks to replace local coach David Bright, who was sacked last month. Applicants have until 30 March to apply but must hold a Confederation of African Football or UEFA Pro License, which rules out local coaches. As well as the Pro License qualification the BFA wants someone who has experience coaching in Europe. 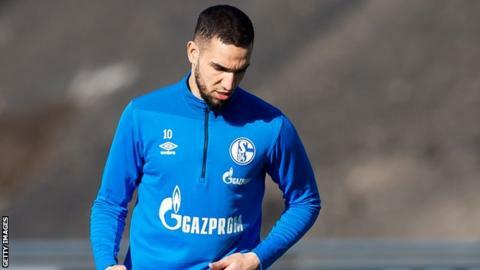 Algeria midfielder Nabil Bentaleb has not yet been reinstated to the Schalke 04 first team, nine days after he was dropped for disciplinary reasons. The German club confirmed to BBC Sport: "There is no new information on this topic. His status hasn't changed." On 21 March Bentaleb posted on twitter an apparent explanation for his absence from Schalke's 1-0 loss to visiting Red Bull Leipzig on 16 March with a photo of him holding his twin babies. "Best thing that could happen in my life that's the reason why I could not be watching the game at the stadium this weekend," he posted. "After 3 months spent with my wife at hospital they made me crazy and forget to send and SMS but thank god everybody is healthy. Let's get points now!" Frenchman Julien Mette is using the international break to bring together a squad of Djibouti players for a first training camp in the local city if Al Sabieh. The 37-year-old took over as coach of Djibouti's senior national team a week ago. The job is a first for Mette at international level but has worked with clubs FC Tongo and AS Otoho in Congo Brazaville. He began his coaching career at just 20 with French club Bordeaux, where he coached several of the club's youth teams over the next 13 years. Nigeria striker Ahmed Musa has stepped up to reward the country's under-23 side that beat Libya 4-0 in the second leg of their second round qualifier on Monday. Victor Osimhen scored a hat-trick and a late goal from David Okereke saw Nigeria overturn a 2-0 loss in the first leg and complete a 4-2 aggregate win. Musa had promised the team one million naira per goal and promptly handed over the equivalent of US$11,000 to the team. The win puts Nigeria into the final round of qualifying for November's Under-23 Africa Cup of Nations, which sees the top three teams progress to the 2020 Tokyo Olympics. DR Congo international Jean-Marc Makusu Mundele has signed for Moroccan club Renaissance Berkane on a three-year deal worth nearly half a million dollars. But the 29-year old striker will have to wait until next season to join the Moroccan from AS Vital club of DR Congo. Mundele netted five goals in all in the ongoing African Champions league, two in the qualifying stages and three in the group stage before his team AS Vital club exited the competition. He scored 11 goals in the 2018 Confederation Cup to help AS Vital club finished as runners-up as they lost to Raja Casablanca of Morocco in the final. Mundele previously played for Hungarian club Ujpest FC, MC Oran of Algeria and Egyptian side Wadi Degla. He has been capped eight times by DR Congo and played at the 2014 Africa Nations Championship (CHAN) finals and again two years later, when they won the title. The President of Tanzania John Magufuli has rewarded national team players with cash and land after their qualification for the 2019 Africa Cup of Nations for the first time in 39 years. Magufuli thanked the team for their excellent performance as they beat Uganda 3-0 in a Group L tie on Sunday to seal qualification. "You have done Tanzania proud and you deserve to be rewarded," said the President. The squad of 25 players and seven coaching will each receive US$5,000 and a piece of land in the capital city Dodoma. Lionel Messi has been ruled out of Argentina's friendly international with Morocco in Tanger on Tuesday because of injury. Messi suffered a groin problem in Argentina's 3-1 defeat to Venezuela in a friendly match in Madrid on Friday which marked his return to international football. It was the first time Messi had played for his country since the 2018 World Cup in Russia. The duo are the latest players to pull out of the Argentine squad after Paris Saint-Germain's Angel Di Maria also withdrew through injury. Juventus star Paolo Dybala is in the squad for the friendly encounter. Morocco and Argentina have only met twice before. Both were friendly contests with Argentina winning 3-1 in 1994 and 1-0 ten years later. South Africa will host Jamaica in Durban on 7 April as both sides prepare for the Women's World Cup finals in France. Both nations will be competing at the World Cup for the first time this year. Coach Emmanuel Ndoumbe Bosso, who was kidnapped and released earlier this week, has been appointed as the new coach of Cameroonian champions Coton Sport. Bosso leaves Cameroon first division rivals Yong Sports Academy of Bamenda and joins on a one-year deal with the option to renew. He replaces Bertin Ebwelle Ndingue, who decided not to renew his contract with Coton Sport. Niger's former Ivory Coast coach François Zahoui has not included striker Moussa Maazou in his 24-man squad for their final Africa Cup of Nations qualifier at home to Egypt on Saturday. The 30-year-old former Monaco, Lens and CSKA Moscow player has been overlooked for the dead rubber group J match because he is currently without a club. Niger can no longer qualify for this year's finals in Egypt. Moroccans miss the chance to see Argentine star winger Angel Di Maria when the Atlas Lions host Argentina in a friendly international on Tuesday. The 31-year old former Manchester United and Real Madrid player currently with Paris Saint-Germain is injured and has been ruled out the the match. Juventus star forward Paolo Dybala and five times Ballon d'Or winner Lionel Messi are both in the squad for their friendlies with both Morocco and Venezuala. Tunisia coach Alan Giresse has called up two more home-based players ahead of their final Africa Cup of Nations qualifier against eSwatini at home on Friday and the friendly international with Algeria four days later. There is a first call up for CA Bizertin winger Houssem Habbassi and the other addition is midfielder Ghazi Ayadi of Club Africain. The duo are brought in as replacement for the three players Dylan Bron, Ilies Skhiri and Wahbi Khazri who have pulled out of the Carthage Eagles' 26-man squad. Tunisia have already booked a place in this year's finals in Egypt. Congo Brazzaville have suffered a big blow ahead of their Africa Cup of Nations qualifier against Zimbabwe on Sunday with confirmation that their star forward Thievy Bifouma will not be available due to injury. The 26-year old, who was originally named in a 38-man provisional squad, has not recovered from a knee injury in time for the decisive Group G clash in Harare. The selection of the former West Bromwich Albion and Espanyol player was a surprise after he picked up a knee injury last month whilst on duty for his Turkish club Yeni Malatyaspor. Congo Brazzaville must win in Harare to stand any chance of qualifying for Egypt 2019. Belgium-based Dylan Bronn is the latest player to withdraw from Tunisia's 26-man squad ahead of their final Africa Cup of Nations qualifier against eSwatini at home on Friday and the friendly international with Algeria four days later. The defender is suffering from an ear problem that has prevented him from flying, according to the Tunisia Football Federation. Bronn is the third player to pull out of Alain Giresse's first squad as coach of Carthage Eagles after Montpellier midfielder Ilies Skhiri and Saint-Etienne's top goalscorer so far this season Wahbi Khazri. Tunisia have already qualified for this year's finals in Egypt. Crystal Palace forward Wilfried Zaha will miss Ivory Coast's Africa Cup of Nations qualifier at home to Rwanda on Saturday and the friendly with Liberia on 26 March. Zaha was named in a 24-man by coach Ibrahim Kamara, having missed the last two qualifiers due to personal reasons as well as an injury. A hamstring injury rules him out of the Elephants upcoming matches after he missed Saturday's 2-1 defeat away to Watford in the FA Cup. "You never know with hamstring injuries and strains in the hamstring, you have to be very, very careful especially with players as explosive as wolf," Hodgson told a post-match news conference. Ajax midfielder Hakim Ziyech looks uncertain for Morocco's Nations Cup qualifier in Malawi on 22 March and the friendly with Argentina four days later. He suffered a relapse of a calf during Ajax's 1-0 away loss to AZ Alkmaar in the Eredivisie and was replaced after 22 minutes. But the Royal Moroccan Football Federation is still awaiting medical reports on Ziyech and Galatasaray midfielder Younes Belhanda. "The medical staff of the national team is in contact with the doctors of their respective clubs while waiting to receive the medical reports determining the nature of the injury and the confirmation of their participation in the training course of the national team," said the FRMF on its website on Monday. Meanwhile Morocco coach Herve Renard has called-up Wydad Athletic midfielder Walid El Karti to replaced Schalke midfielder Amin Harit, who has pulled out due to injury. Portugal-born forward Wilson Eduardo is set to make his debut for Angola in their decisive Africa Cup of Nations qualifier away in Botswana. The 28-year-old's inclusion in coach Srdjan Vasiljevic's 27-man squad fulfils the wish of his father, who died recently. Angola are second in Goup I with nine points and can qualify for this year's finals in Egypt with a victory. Eduardo has played for Portugal at several youth levels before deciding to switch allegiances to his father's land. Eduardo currently plays for Portuguese top flight league club Sporting Braga and have scored eight goals in 24 league appearances so far this season. Lesotho will camp in Pretoria in South Africa as they prepare for their decisive final Africa Cup of Nations qualifier against Cape Verde in Praia on 24 March. Coach Moses Maliehe has selected 22 players for the group L clash as they aim to qualify for their first ever Nations Cup finals. Lesotho are level on five points with Tanzania in group L but are ahead on a better head-to-head record and can still go through if they draw and Tanzania fail to win at home to Uganda who have already qualified. South Africa based Forward Nkoto Masoabi and midfielder Ts'oanelo Koetle are recalled to Lesotho's squad. Algeria coach Djamel Belmadi has dropped captain Yacine Brahimi and Nabil Bentaleb for their final Africa Cup of Nations qualifier against The Gambia in Blida on 22 March. The Desert Foxes have already qualified while the Gambia still have a faint chance of qualifying. Fenebahce striker Islam Slimani, Ishak Belfodil of Hoffenheim and Schalke midfielder Nabil Bentaleb have all been overlooked. Sofiane Hanni, Ryad Boudebouz and fit again Napoli star Faouzi Ghoulam are also left out as Belmadi takes an opportunity to look at locally-based players ahead of Egypt 2019. Belmadi has named star players Riyad Mahrez, Sofiane Feghouli, Aissa Mandi, Saphir Taider, Rafik Halliche and Baghdad Bounedjah. The Scorpions must win in Blida, a venue where Algeria are unbeaten in 33 matches, and hope for a draw between Benin and Togo to reach their maiden Cup of Nations finals. Mozambique coach Abel Xavier has included nine foreign based players in his squad ahead of their decisive Africa Cup of Nations qualifier against Guinea Bissau in Bissau on 23 March. The Mambas are currently third in Group K with seven points and must win to qualify for this year's finals in Egypt. Guinea Bissau and Namibia are tied on eight points but the former are top on head-to-head points. Zambia, who can no longer qualify, are bottom with four points. Reinildo Mandava who plays for French Ligue 1 club Lille and the South Africa based duo of Edmilson Gabriel Dove and Mambas captain Elias Gaspar Pelembe, are all included. Reginaldo Faife, based in Albania, and the Portugal based duo of Zainadine Junior and Joao Quembo also make the squad as do Edson Andre Sitoe who plays for Rennes, Germany-based Stanley Ratifo and Geraldo Matsimbe who is based in Portugal. The overseas players will fly directly to Pretoria in South Africa to join 23 selected locally-based players who are there at a training camp and have already played a friendly there with Eswatini which finished 1-1. Injury means Bordeaux winger Samuel Kalu, 21, has been replaced in the Nigeria squad, two weeks after his mother was kidnapped and then released by gunmen in the south-eastern city of Abia. Super Eagles coach Gernot Rohr, who provided personal support to Kalu in France during the ordeal, has called up Under-20 captain Ikouwem Udoh as a replacement for the final Africa Cup of Nations qualifier against Seychelles on 22 March. The three-time champions, who have already booked their place in the finals, take on tournament hosts Egypt in a friendly four days later. "Kalu is unfortunately ruled out of the two matches with injury and Enyimba's Ikouwem Udoh as been drafted in as a late replacement," team spokesman Toyin Ibitoye told BBC Sport. Udoh is a left-back who played for Nigeria in the final of last year's African Nations Championship, losing 4-0 to Morocco. Rohr has said he is keen to get more left-sided players into his squad in the run up to the Cup of Nations. Burkina Faso coach Paulo Duarte has named star striker Aristide Bance in a 24-man squad for the must-win Africa Cup of Nations qualifier with Mauritania in Ouagadougou on 22 March. Bance, who has 73 caps and recently returned to play in Burkina Faso, has missed the last four qualifiers with an Achilles tendon problem. Banou Diawara, Ousmane Sylla Junior and Dylan Ouedraogo are recalled, having missed the 2-1 defeat to Angola in November. Captain Charles Kabore is suspended but star names such as the Traore brothers, Alain and Bertrand, Bakary Kone, Jonathan Pitroipa and Prejuce Nakoulma are included. Germain Sanou, Edmond Tapsoba, Souleymane Kouanda, Souleymane Sawadogo and Djibril Cheick Ouattara have all been dropped. To reach the finals in Egypt, The Stallions, who are currently third in Group I, must beat already qualified Mauritania and hope Angola do not win in Botswana. France-based veteran defender Salim Moizini has been handed his first call-up by Comoros for their decisive qualifier with Cameroon in Yaounde on 23 March. Moizini, who was born in France and currently plays for third tier side Lyon Duchere, is among 20 players picked by Coelacanths coach Amir Abdou. Comoros, who are attempting to reach their first Cup of Nations finals, are currently third in Group B with five points and must win to qualify. Defending champions Cameroon, who are second with eight points, only need to draw to go through alongside current group leaders Morocco. Comoros will have to play without their top scorer in qualification, El Fardou Mohamed Ben Nabouhane, who is suspended. Benjaloud Youssouf, Ali Mmadi, Mohamed Youssouf, Faiz Selemani and Ibroihim Youssouf are all recalled. Strasbourg forward Nuno Da Costa has been left out of Cape Verde's 25-man squad to face Lesotho in a decisive Africa Cup of Nations home qualifier in Praia on 24 March. No official reason has been given for the absence of the 28-year old striker who has netted five goals in 25 Ligue 1 appearances so far this season. Cape Verde are bottom of Group L with four points but can still qualify, being just a single point behind both Lesotho and Tanzania. To go through, The Sharks must win and hope leaders Uganda, who have already qualified for the finals in Egypt, do not lose to Tanzania in Dar es Salaam. Swedish club Jonkoping Sodra IF have completed the signings of a trio of young players from Ghanaian second tier side Nkoranza Warriors. The deals will keep midfielder Aaron Donkor, 18, striker Emmanuel Boateng Agyenim, 19, and midfielder Sadick Abubakari, 21, at the club until the end of the 2019 season, with the option of a three-year extension. "These three players are part of the long-term ambition to strengthen the association to have more players with good quality who in the long run can also bring in revenue to the club," the Swedish side announced on their website. Both Jonkoping Sodra IF and Nkoranza Warriors recently signed a co-operation agreement. Mauritania coach Corentin Martins has handed first call-ups to France-born players Ibrahima Coulibaly and Souleymane Anne ahead of the final Africa Cup of Nations qualifier against Burkina Faso in Ouagadougou on 22 March and a friendly international with Ghana in Accra four days later. Mauritania are top of group I and have already qualified for this year's finals in Egypt, while Burkina Faso - who are third - need to win to have any chance of going through. Coulibaly 29, plays for French Ligue 2 side Grenoble as a midfielder while Anne, 21, is a striker who has scored 12 goals so far for his third tier league side Aurillac Arpajon. Mauritania's captain Addoul Bah of French club Auxerre and Diadié Diarra who plays for another French side Sedan are missing because of injury. The players will converge in Rabat in Morocco for a training camp from 17 to 20 March before travelling to Ouagadougou. Morocco international Hachim Mastour has terminated his contract with Greek club PAS Lamia by mutual consent. The 20-year old attacking midfielder joined Lamia last September but only featured for 64 minutes in four league games, and did not return to the club after the winter break. Born in Italy to Moroccan parents, Mastour joined the Greek side on a free transfer after his contract with AC Milan - where he failed to break into the first team - ended. He was capped seven times by the Italian Under-16 national team before switching allegiance to Morocco in May 2015. Mastour made his first and only appearance so far for the Atlas Lions against Libya at home in a 2017 Africa Cup of Nations qualifier the following month. Star striker Michael Olunga has been ruled out of Kenya's final Africa Cup of Nations qualifier against Ghana. Olunga, who plays in Japan for Kashiwa Reysol, injured his hamstring in a J-League match last weekend. The 24-year-old has been ruled out for three weeks, according to Football Kenya Federation (Fkf). "In his place, coach Sebastien Migne has called up Zesco United forward Jesse Were," added the Fkf. Both Kenya and Ghana have already qualified from Group F.
It will be Harambee Stars' first appearance in a Cup of Nations finals for 15 years. Morocco defender Noussair Mazraoui has extended his deal with Dutch giants Ajax Amsterdam until the end of June 2022. The versatile 21-year-old was rewarded with a one-year extension after an impressive 2018/19 season, so far providing four goals and four assists in 38 appearances for the club. A former youth international, Mazraoui made his debut for the Atlas Lions against Malawi in September. Comorian international goalkeeper Ali Ahamada has joined Norwegian club Kongsvinger IL on a one-and-a-half year deal. The 27-year-old signed as a free agent after terminating his contract with Turkish club Kayserispor a year ago. Ahamada last played for Kayserispor in May 2017, but his lack of game time has not affected his position as first choice for Comoros. He has so far played in four of their five Group B games in Africa Cup of Nations qualifying against Morocco, Cameroon and Malawi. The Coelacanths can still reach their first ever Cup of Nations finals if they beat Cameroon in their final qualifier later this month. Liberia defender Dirkir Glay has returned home to join top tier side LISCR FC on a two-year deal as a free agent. Glay, who is hoping to force his way back into coach Thomas Kojo's squad, last played for Indonesian team PS Mojokerto Putra. The 27-year-old, who has 10 caps, made his international debut against Togo in June 2015. But he hasn't played for his country since Liberia's 3-0 defeat in Zimbabwe in their opening Africa Cup of Nations qualifier in June 2017. Glay joins a growing list of Liberians, including George Gebro, Teah Dennis and Christopher Jackson, who have made the move back to the Liberian Premier League, having played in Europe or Asia. Nigeria's Lucky Omeruo has joined Spanish La Liga side Leganes, but the 23-year-old will play for the club's B side in the Tercera División (fourth tier). He is the younger brother of Nigeria international defender Kenneth Omeruo, who is on loan at Leganes from Chelsea. Kenneth is a regular with Leganes' first team and won the Nation's Cup in 2013 and played in two World Cups (2014 and 2018). "Lucky Omeruo is a player who stands out for his versatility on the field, contributing both offensive and defensive tasks due to his great physical power. Omeruo has been an U-20 international with Nigeria," the club announced in a statement. The right wing-back has already been working under coach José María Rico at Leganes. Namibia coach Ricardo Mannetti has named a 28-man squad for their crucial Africa Cup of Nations qualifier against Zambia later this month. A win in their final qualifier will guarantee the Brave Warriors a place at the finals in Egypt. Mannetti says the squad will be cut to 23 before they travel to Zambia. Captain Ronald Ketjijere, forward Sadney Urikhob and goalkeeper Virgil Vries are among the regulars included. Other notable names are the Zambia-based midfielders Willy Stephanus and Petrus Shitembi. But defenders Larry Horaeb and Chris Katjiukua are suspended. Namibia are level on eight points with Guinea-Bissau at the top of Group K and could still qualify for the Nations Cup with a draw or defeat if Guinea-Bissau don't lose their final game against Mozambique. Should Namibia make it through they will be searching for their first victory in the finals of a Nations Cup, having come away with just a point in both of their two previous appearances in Burkina Faso in 1998 and ten years later in Ghana. Zambia no longer have any chance of qualification and the match will be the last for their Belgian coach Sven Vandenbroeck who has been told that his contract with the Chipolopolo will not be renewed. Congo Brazzaville star Thievy Bifouma has been named in his country's 38-man provisional squad for the Africa Cup of Nations qualifier against Zimbabwe in Harare on 24 March. The selection of the former West Bromwich Albion and Espanyol forward for the Group G clash is a surprise after he picked up a knee injury last month that was expected to keep him out. Captain Prince Oniangue, who is with French club Caen, Belgium based defender Marvin Baudry and midfielder Delvin Ndinga of Turkish club Sivasspor are also included in the squad. France-based trio of Faitout Maouassa, Eden Massouema and Burnallerge Etou have all been called up for the first time, while there is a recall for Blackpool goalkeeper Christoffer Mafoumbi. The Red Devils must win in Harare to stand any chance of qualifying for Egypt 2019. Togo forward Razak Boukari will miss his country's crucial Africa Cup of Nations qualifier against Benin after being ruled out for the rest of the season with a thigh injury. The 31-year-old was among 22 players picked by Sparrow Hawks coach Claude Le Roy for their Group D encounter in Cotonou on 24 March. Togo must win in Benin to book their place at the finals in Egypt while their opponents only need a draw to qualify. Boukari, who plays in France for Ligue 2 side Chateauroux, picked up the injury during a league match with Beziers on 22 February. "Following further tests, the medical staff in charge of my case have advised me to undergo surgery that will take me away from the field until the end of the season," Boukari said in a statement on the club website. "I took the decision to follow this medical advice to be able to return to competitive football in the best conditions this summer." Boukari has scored four goals in 17 league appearances for Chateauroux this season. "I thank all those who have shown their support so far and wish the best to my teammates and staff to achieve the goal of the club." On the international scene, he has made 19 appearances for the Sparrow Hawks scoring a single goal. He faces a race against time to be fit to play in the Nations Cup should Togo qualify. Guinea international Ibrahima Conte has joined Kazakhstan top tier side FK Aktobe in a bid to resurrect his career and force his way into contention for this year's Africa Cup of Nations. The 27-year-old midfielder has signed a one-year contract with an option to extend the deal for another year. The Kazakhstan league starts on Saturday. Conte makes the move from Belgian top flight club Oostende, ending his stay there six months before the end of his contract due to a lack of playing time. "Ibrahima Conte leaves with immediate effect to Aktobe of Kazakhstan. We wish him every success with his new employer," Oostende posted on their website. Conte's last appearance for Oostende was against Zulte Waregem in February last year. He has played in two previous Nations Cups, in 2012 and 2015, but has not been called up for any of Syli Nationale's five qualifiers this time around. The move to Kazakhstan marks the end of a nine-year stay in Belgium where Conte has spent his entire professional career playing for clubs including Gent, Anderlecht, and Waasland-Beveren. The Confederation of African Football (Caf) has suspended referee Antoine Max Depadoux Effa Essouma for one year following the weekend's Confederation Cup group game between Moroccan clubs Renaissance Sportive de Berkane and holders Raja Casablanca. The match finished 0-0. Caf said its Referees Committee reached the decision because of "the weak and unsatisfactory performance which had an impact on the final result." Meanwhile, Kenya's Football Federation (FKF) has launched an official complaint over officiating in Gor Mahia's Confederation Cup match away to NA Hussein Dey of Algeria on Sunday which Gor lost 1-0. The FKF claim Malian referee Boubou Traore wrongly disallowed a Gor Mahia goal. Zimbabwe coach Sunday Chidzambwa has named a strong squad for the Warriors' Africa Cup of Nations qualifier at home to Congo-Brazzaville later this month. Zimbabwe need a win or a draw to qualify for June's tournament in Egypt. Belgium-based Knowledge Musona is included while Tendayi Darikwa of Nottingham Forest in the English Championship returns after missing the last game due to suspension. "We have a bunch of very good, disciplined young men who we feel and think will do the job for the nation," said Chidzambwa. "We're going to leave no stone unturned from day one when we get into camp." Nigeria Under-20 striker Victor Okoh Boniface has joined Norwegian top-tier side FK Bodø/Glimt on a four-year deal from Real Sapphire FC in his homeland. The 18-year-old, who first caught the attention of Glimt during a scouting trip to Nigeria in 2018, impressed after training with the club in Norway. "It was in Nigeria that we noticed Boniface for the first time. We've liked him ever since he came," said the club's sporting director, Aasmund Bjørkan. "He is very young, so he has plenty to work with, but we feel there is potential there that we think is exciting. "Boniface is a slightly different type of forward than those we already have," Bjørkan added. Boniface is a regular for the Flying Eagles, but a knee injury ruled him out of last month's African Under-20 Championship in Niger. West Ham United's Pedro Obiang headlines a list of 17 Spanish-born players who have been called up for Equatorial Guinea's Africa Cup of Nations qualifier against Sudan in Khartoum later this month. Coach Angel Lopez has named a 24-man squad for the match on Friday 22 March which marks the end of the 2019 campaign. Only seven of the squad were born in Equatorial Guinea and only three are from clubs in the small central African country. Neither country can qualify from Group A where Madagascar and Senegal instead will go onto the finals in Egypt in June. The 17 Spanish-born players have dual citizenship and are eligible to play for Equatorial Guinea through blood ties, as the country's football federation has now moved away from its previous policy of granting citizenship to players from countries elsewhere in Africa and Latin America. Obiang - born in Mallorca - played for Spain at junior level but made a switch in international allegiance last year and debuted for Equatorial Guinea in November when they lost 1-0 to Senegal in Bata. Uganda head coach Sebastien Desabre has named a provisional squad of 46 players ahead of their final 2019 Africa Cup of Nations qualifier away to Tanzania later this month. Borussia Dortmund defender Herbert Bockhorn is called up for the first time - one of 15 foreign-based players chosen by Desabre. A list of 31 locally-based players has also been released, which will be cut down to nine players following a regional tour match in Kampala on 16 March. The 24-man squad will then head to a training camp in Cairo before the match against Tanzania on 24 March in Dar es Salaam. The Uganda Cranes have already qualified for the 2019 Africa Cup of Nations in Egypt from Group L, but Tanzania still have a chance to go through - as do Lesotho and Cape Verde. Tanzania and Lesotho are both on five points with Cape Verde a further point back. Cape Verde host Lesotho in the other Group L match. Herve Renard - who coached Ivory Coast to their Africa Cup of Nations success in 2015 - has congratulated goalkeeper Boubacar Copa Barry for a "superb career" after he announced his retirement from football at the weekend. Barry was part of the Elephants' triumphant team, saving two penalties and scoring the winning spot-kick in their dramatic victory over Ghana in the final. Coach Renard, currently with Morocco, is among those applauding Barry after he decided to hang up his gloves for good. "Congratulations Copa Barry for your superb and long 22 years career," Renard tweeted. "A winner of Africa Cup Of Nations. Wish you lot of success in your new life." Barry is now the goalkeeping coach at Belgian side OH Leuven, the club he joined in 2017. Ivory Coast celebrate their 2015 Africa Cup of Nations victory. Gabonese football is mourning the death of league player Herman Tsinga who died after collapsing during a match on Saturday. The 30-year old Akanda FC player collapsed in the first half of their match against Missile FC in the Gabon top flight. Local media reported that Tsinga died on the way to hospital. The cause of death is not yet known. "We have just lost Tsinga Hermann Leyigui, this is a shocking news," Akanda FC posted on their Facebook page. The Gabonese Football Federation (Fegafoot) also paid tribute to the midfielder. "Fegafoot has learned with dismay of the death of the player Herman Tsinga, member of the club Akanda FC. "We send our sincere condolences to the entire bereaved family, the Akanda FC and all Gabonese football players for this painful loss." "We share your sorrow and we are wholeheartedly with you," Fegafoot said. Gabon's Sport minister Alain Claude Billie By Nze also paid his respects. "It is with sadness that I have just heard of the death of the young Herman Tsinga, player of Akanda FC. "All the condolences of the Ministry and the football community to his family and his club," the sports minister tweeted. Congo Brazzaville striker Thievy Bifouma looks set to miss his country's crucial 2019 Africa Cup of Nations qualifier away to Zimbabwe on 24 March. The 26-year-old injured his knee while on duty with his Turkish club Yeni Malatyaspor during a Super Lig game at Konyaspor on 10 February. His club say he will be out of action for four weeks. The France-born forward played for the country of his birth at youth level before switching allegiance to Congo Brazzaville. The Red Devils must beat Zimbabwe to stand any chance of qualifying for Egypt 2019. Bifouma has played in most of Congo Brazzaville's qualifying matches so far, missing the 2-1 defeat to Liberia in Monrovia in October 2018. Nigeria international Aaron Samuel has returned to China by joining second-tier side Sichuan Longfor for the 2019 season. The 24-year-old joins Chinese League One club as a free agent after mutually terminating his contract with Israeli outfit Beitar Jerusalem in December 2018. Samuel scored 15 goals in 35 appearances during his previous spell in China with Guangzhou R&F between 2014 and 2017. He had a short loan spell at CSKA Moscow in February 2016 before joining the Russian club on a permanent basis in January 2017. Samuel has also played for Russian side Amkar Perm and Norwegian clubs Vålerenga and Sarpsborg 08. A former Nigeria youth international, he has scored twice in seven senior appearances for the Super Eagles. Football's world body Fifa has banned Mozambique football official Sidio Jose Mugadza for 15 years from all football-related activity. Mugadza, who Fifa say is affiliated to the Mozambican Football Association, has been found guilty of having accepted bribes in violation of Fifa's code of ethics. He has also been fined 3,000 Swiss francs ($3,000). Fifa say they notified him of their decision on Thursday, the date on which the ban came into force. Mugadza is the third African official banned this week by Fifa. The Botswana Football Association (BFA) has named Mogomotsi Mpote as the interim national team coach, following the recent sacking of David Bright. Botswana's Football Association confirmed the sacking of national coach David Bright last month. Mpote, a local coach in charge of Botswana Premier League side Orapa United, will be on the bench when the national team plays Angola in the final round of 2019 Africa Cup of Nations qualifiers on 22 March. The Zebras have endured a winless campaign so far in the qualifying campaign. Mpote will be assisted by another local coach, Rapelang Tsatsilebe, while former Zebras captain Modiri Marumo comes in as goalkeeping coach. The BFA has begun the search for a substantive replacement, with former coach Peter Butler reportedly interested in the position. Liberia international Allen Njie has joined Swiss Super League side Grasshopper Club Zurich until June 2023, but the 19-year-old will play for the club's under-21 side in the fourth tier. The Liberian-born Gambian previously played for Liberia's LISCR, making appearances in the African Champions League and Confederation Cup. Allen, who made his senior debut for Liberia in the 1-1 draw with DR Congo in an Africa Cup of Nations qualifier in September 2018, has four caps. He captained Liberia's under-20s to a silver medal in the West African Football Union (Wafu) Nations Cup in Monrovia in May 2018.